For a friendly venue in Northern Virginia playing host to a Republican presidential candidate, yesterday’s crowd at American Legion Post 176 was surprisingly small and low-key: Maybe 200 folks, mostly veterans in gold-piped garrison hats, crowded into the banquet hall to hear Mitt Romney give a boilerplate stump-speech. 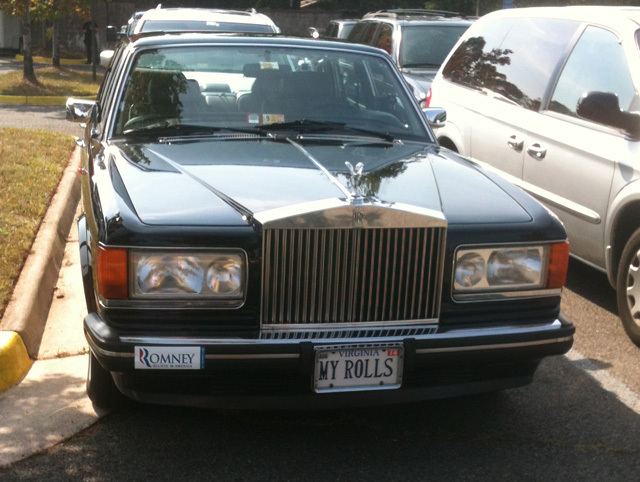 Rolls-Royces for Romney Adam WeinsteinAfter Romney completed his short, statistics-heavy stemwinder on the evils of Obamacare and defense sequestration, many in the crowd were more than happy to offer Mother Jones their opinions on Barack Obama, “liberal polls,” and Romney’s videotaped dismissal of the “47 percent,” first reported last week on this website. Romney was simply saying that there are a good number of people in the country on the one hand that don’t pay taxes. They really don’t. But they get most of the welfare and those types of handouts. Most of them would rather actually be working. And the current administration wants to buy them so they can make them dependent on the government rather than working on their own. Which is totally the antithesis of anything that this country stands for…I used to work in unemployment, run an unemployment office, I saw it everyday. I used to run the office in Virginia for almost 30 years. He doesn’t feel that way except for…I take that back. He probably does feel that way. But he told the truth, and people don’t want to hear the truth…People on the dole. It’s like, how do people go off unemployment and go on disability? Where is that coming from? How did that happen? You’re not disabled just because you don’t have a job. We should be out there finding people jobs instead of scooting people from one dole to the other. Getting someone in that White House who will actually fight for the American citizen. For all the constitutional rights and responsibilities we have that are not very well taken care of by this current guy, who says—on oath!—he’ll swear to uphold the Constitution of the United States of America. It ain’t happenin’.